Our goal is nothing less than a community of fully devoted and fully developed Christ-followers, people whose lives reflect accurately the life of Jesus Christ while he was on earth. 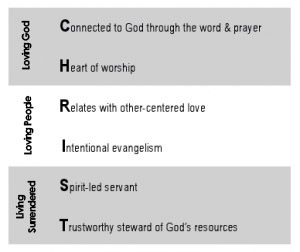 This is what it means to be the church: the body of Christ here and now. Because of the love we have for our family, friends, co-workers, neighbors, etc., we BUILD relationships with them, serve them, model CHRIST to them and explore what they believe about Jesus. This leads to spiritual conversations that directly relate to their spiritual questions and concerns and offers opportunities for us to lovingly share the gospel. These spiritual conversations make it more natural for us to BRING them to a LifeGroup, Worship Service, Bring Event, or just relational activities with other believers. The more they interact with other believers, the more they experience the love of God and start to feel they BELONG. This allows them to see and hear the gospel lived out and spoken through relationships. Throughout this process we are praying and listening to the Holy Spirit and looking for opportunities to share and explain the gospel so they might BELIEVE the truth of the gospel, surrender their lives to Christ and put their faith in Him. Once they believe, Christians who know them continue the relationship by discipling them, helping them in the lifelong adventure of BECOMING more like CHRIST.